Most of us rely on our Tax Consultant, and CA or maybe TRP (Tax return preparer) for filing our annual ITRs ( Income Tax Return) tax returns/ refund dues and also in case we receive some notice form the IT department. A letter from the Income Tax department and its notices are feared most and one starts getting sleepless nights if something so happen. But, you need not be fearful as our Income Tax Department has created a great website https://incometaxindiaefiling.gov.in/ and http://incometaxindia.gov.in/home.asp for citizens and you must use and know it fully. While the above professionals help you in all your IT matters and you must avail their service, you should still check your ‘IT facts’ using the above website online to see if all is well with your Income Tax! Knowing more about your taxes is always good and the more you know the better you can deal with the professionals and also with department. Other than this, more information helps in forming your Tax planning strategies. Remember, they are going to use the same website and tools which you may also see yourselves. Let us now discuss, how to do it? Please check with your Tax Consultant and obtain your USER ID and password from him, if he has already registered you with the IT department. The USER ID is always your PAN Number. If you are not yet registered then you have to first register to see the details. Once you land on the above website, a screen (see the article image) will open. Here, on the left hand side of the website you can view the following 12 services under ‘SERVICES’ header. You may select the option you are looking for. Here, I strongly recommend using the TAX CALCULATOR as this helps you know your tax burden immediately and therefore helps you formulate your Tax planning strategy for the current financial year. If you have not done your tax planning yet, you still have 4 days left in the current FY. Once you click on the TAX CALCULATOR link or any of the links, your USER name (your PAN No.) will be asked followed by the password and also the date of birth in dd/mm/yyyy format or you may be asked to type the captcha code (depending upon the option you have clicked). If you are new to the website, you should click on ‘Register Now’. See the image below. This is the most important section as it shows the status of the ITR filed by you from 2007-08 to till the last FY (as seen while writing this article on 27th Mar’14). Filing the ITR in time is very important but equally important is the acceptance of same by the IT department. Here, you might get alarming remarks like ‘Return uploaded’ under ‘STATUS’ bar. This simply means that even though you have filed the ITR (Income Tax Return) it has not been processed due to reasons, like – ‘less tax paid’ or ‘mismatch in calculating tax’ or even more alarming ‘mismatch in TDS’ shown by you and found by IT department through TRACES https://www.tdscpc.gov.in/ - we will discuss TRACES later in the article). You need to contact your Tax Consultant in this case or click to the ‘Rectification request’ available in the same dropdown in ‘MY Account’. 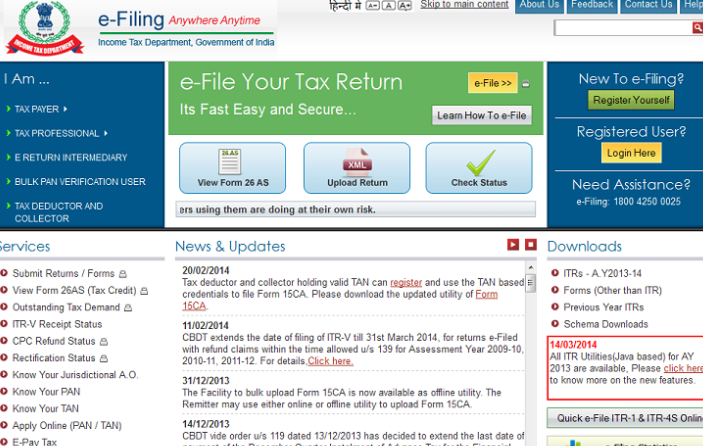 However, you need worry in case the remark is “ITR processed” as this simply means your ITR has been accepted. From this section you can also click on the ITRS filed from 2007-08 to the latest one and download the ITRs in pdf format. We suggest that you should save and preserve this if you are not having one already. Here, you can see the tax demand made by IT department, if any, for various assessment years. In my long experience I have found that people keep on changing their residence due to transfer to other cities/ jobs etc. but do not update their communication address with the IT department. Normally, the department will send you a notice in case of a tax demand but if you have changed the residence and not updated your address with the department, chances are that the notice will not reach you and therefore will not be complied by you.Therefore, not only you should keep your address updated with the IT department, you should also check the above link now and check if you have any ‘Outstanding tax demand’? This section shows the demand amount, Assessment year of the demand, demand identification number, date of demand and the section under which the demand has been made. This section lets you know if there is a demand or a refund due to you against each assessment year. Check the status bar which will show remarks like - ‘Not determined’, ‘No demand no refund’ or ‘demand determined’. Accordingly, you should initiate an action or start a conversation with your Tax consultant. This is an option through which you can check the total TDS done by your employer, TDS on interest of fixed deposits or bonds, agency commission, or any other kind of TDS against your PAN Number in a financial year. The good thing about 26AS is that its records are updated regularly and can be viewed any time, even during the financial year. You need not wait for the FY to end and then know how much TDS has been done and by whom against your PAN? Once you click on this option, you will be redirected to the TDS-CPC website https://www.tdscpc.gov.in/ from where you can click the ‘view tax credit form’ and select the assessment year. Normally, it will show all the TDS done for last 5 assessment years against your PAN number by different parties. The TDS report (form 26AS) can also be downloaded in pdf. Please note that ideally all the TDS done under your PAN no. should reflect here else you should take up with respective parties. Please also note that IT department reconciles your tax deposit amount in the ITR with Form 26As and any mismatch might result in botheration for you. So, better check it once in a while during the ongoing FY for peace of mind. Though I have covered only 4 (four) very important aspects in this article as readers will find it very relevant and important as only 4 days are left in this financial year. I will come out with description of more features of the Income Tax India website in my forthcoming series.